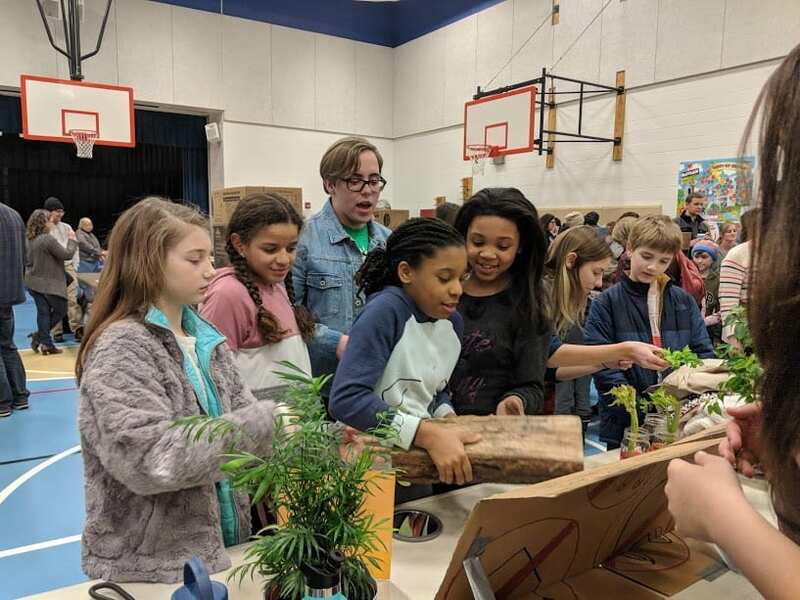 On Monday, February 25th, Eco Action showcased the power of plants at the Easterly Elementary annual Science Fair. Our first time tabling at the event, Eco Action members were able to show their stuff as they explained to elementary students, and other science fair attendees, the ability of plants to sequester carbon and act as drawdown solutions by “rolling back global greenhouse gas emissions” (Paul Hawken, Project Drawdown). Through five different interactive stations, participants were able to learn more about the photosynthesis of plants. Students saw colored water being taken up by the capillaries in celery stalks, turning the plants’ leaves different colors. Participants learned that plants, such as a log used for demonstration, receive their mass from carbon dioxide. In addition, respiration was expressed through the use of a hand mirror to show the appearance of condensation and oxygen bubbles were seen surrounding a plant leaf in a test tube. Participants were also able to feel how the increasing levels of carbon dioxide released into our atmosphere can heat up the earth and create for an unpleasant experience, as demonstrated through a think-lined blanket that we wrapped around participants. The overall event was highly successful and Eco Action was glad to participate in this community event. We are looking forward to helping again next year! To learn more about the event, and other participants, you can follow the Easterly Parkway facebook page here.